Press F5 to update image The province is replacing the East River Bridge on Highway 7 in Sheet Harbour and upgrading the bridge approaches. The existing steel arch bridge was opened in 1956 and is nearing the end of its intended lifespan. The new, 183-metre bridge is being built to the immediate south of the existing bridge. The existing bridge will remain open until the new bridge is ready. The location was chosen to improve safety, minimize the impact on properties around the bridge, and to allow the old bridge to stay open during construction. Changes to the roads around the bridge will also improve road safety in the area. 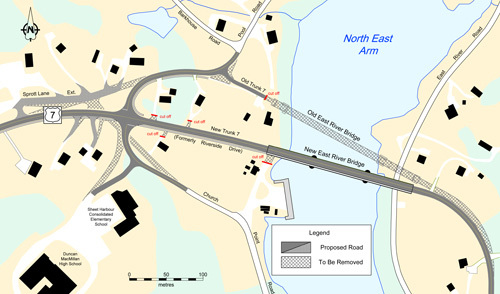 The final design for the new bridge and the associated road modifications were completed in early 2014. The contract was awarded to Dexter Construction in August 2014 and work began in September 2014. The total project cost is approximately $19-million dollars. The federal government is providing up to $7.2-million toward the total cost through the Major Infrastructure Component of the Building Canada Fund. On the west side of the river, Highway 7 (Marine Drive) will be realigned to follow along what is currently Riverside Drive. Highway 7 will also be slightly realigned on the east side of the river before it gets to Route 374. A number of other roads in the area will be affected. Pool Road will be extended and realigned to create a single intersection with Church Point Road at Highway 7. Sprott Lane will also be extended along an abandoned section of Highway 7 to maintain access for several households. The bridge was constructed in the 1950s and has served its intended service life. The department considered performing repairs but a full replacement was determined to be more cost effective. The new bridge will be designed for a 75 year service life. Is the existing bridge safe to use now? Yes, the existing bridge is inspected regularly to ensure public safety. A conceptual drawing of the new bridge is shown above. Construction began in September 2014. When will the new bridge be open? The new bridge and road upgrades are expected to be complete in late 2015. The demolition of the existing bridge will take place shortly thereafter with an anticipated completion date of 2016. What will the new bridge cost? Will any homes and/or properties near the bridge be affected? Some properties were required in order to make it possible to construct the new bridge. A number of other properties will be partially affected by the road modifications and improvements. The department has had discussions with those land owners whose property may be impacted. Contact acquisition and disposal officer Rod MacInnis at (902-625-4387) if you have any questions or concerns regarding property or land. Will the existing bridge still be open to traffic during construction of the new bridge? Yes. The new bridge will be built beside the existing bridge. Traffic can use the existing bridge until the new one is complete. Traffic on the old bridge may be occasionally delayed for short periods of time during construction. Will any of the work have to be done at night? Night work is not anticipated for this project at this time. What impact will construction have on the surrounding area? The biggest impact will be the area will have a new improved bridge. There will, of course, be inconveniences associated with construction. While every attempt is made to minimize these inconveniences there will be more heavy vehicle traffic, than usual, as well as increased noise and dust, from construction, and occasional traffic delays. If I have any additional questions or concerns, who should I contact? The general contact person for this project is project engineer Tim Jordan 902-827-5388. How will the site be secured to ensure the safety of the public (school nearby, children, etc.)? The contractor will be responsible for security and supervision of the site to ensure public safety.